First off, I know this post will not pertain to many of you, as you either don't have children, or they are all grown and out of the house....so bare with me. It's a Friday First here! 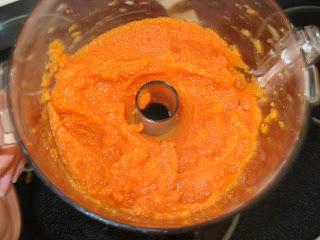 I received a new food processor from my in-laws this year, and my first thought was homemade baby food. Not because I'm a freak that will never feed my baby food out of the jar, but more because I enjoy it. I like making it, and in return I know he is getting healthy food in his tummy. I will be the first to tell you though....there will be times I use jarred food out of convenience, or just laziness, so please don't think I'm promoting making your own, or that it is better. To each is own! These are just a few, but mainly the ones I've tried out so far. I will tell you little man does not like avocados so far (which saddens me a little)! But, remember don't give up. Give it a week or two and try, try again. It takes a little baby awhile to develop a taste for something, so my little guy could very well end up liking them later on. 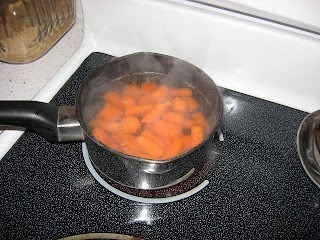 Carrots - From boil, to puree, to dish! Obviously, since little man is just 6 months old we haven't gotten to Stage 2 yet. But these foods should be introduced when your baby has a few teeth and can easily start mashing food up with their gums. Cook veggies (if fresh, with a harder texture) in some boiling water to soften, put in food processor or blender with a little of the cooking water, this will help to get the mixture very smooth. When pureeing a big batch, freeze food in ice cube trays. 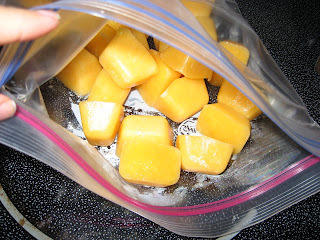 When they are completely frozen, remove from trays and store in a freezer bag in the freezer. When needed pop out a couple cubes and let thaw. Many foods do not need to be cooked prior to blending - bananas, green beans, avocados, etc. These foods are already naturally soft. Here's the thing - don't be afraid to try all foods for your baby, even if YOU don't like them. I think we often don't give our children certain foods because A) we didn't grow up eating them or B) we don't like them. Trust me, the more you introduce your child, the less picky they will be. One of my pet peeves still today is when I hear a parent say, "Oh, don't eat that you won't like it", or "That will be too spicy for you". Let them try it for themselves! They could have a totally different palate than their parents. Okay, enough of my soapbox....again, these are only my opinions, please don't feel offended in anyway, or feel that you NEED to make your own baby food. Like I said, each parent does it differently, and each kid seems to turn out just fine! I don't have kids, but I liked this post. I imagine I would want to make baby food for my baby in the future. Although, who knows? I love my food processor!! 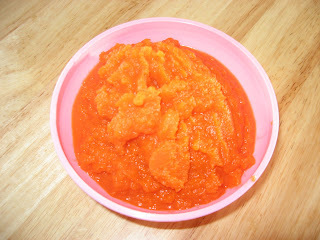 I have made some baby foods but my kids are sooo picky!!! Maybe this next one won't be;) Here's hoping!! 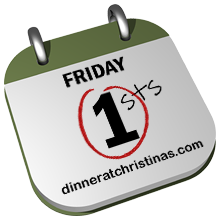 Yay, thanks for the Friday First! This is totally awesome! My mom made all of our food, but I think b/c it was cheaper. Amen to the trying all foods!! Tastebuds are constantly changing as they develop. That's also a hugeee pet peeve of mine. Last week J's mom gave us a big plate of fruit and conversationally J said "dig in" to his little brother and she had to step in and say "he won't eat it, only grapes." Uh.. ok? And when was the last time you made him try it -- age 4???? He's 18 now! He can try a strawberry, it won't kill him! I love that you make your own baby food. One day when I'm a mom I hope to do the same! Great job! I never bought baby food when Hannah was little - I just pureed what we were having basically! I love this post! I'm so interested in making my own baby food one day. Good for you!! I think you are on the perfect and right track. Make what you can, keep trying and you will get kids who love all foods. Keep trying is the best thing and let them see YOU eat it. I mean the real deal when he gets to finger food chop up your food too and 'share' the fruits and veggies with him. He will enjoy it! And pay you back later on! Even now I dont need this baby food recipe, but I will forward to my sister-in-law who soon will deliver baby. so sweet a blog-to answer ur prev post on cookies -i love a good chocolate cookie,crisp and crunchy all the way thru...what about u? What a great tutorial! You make making your own baby food seem so easy. Thank you so much! While I don't have any of my own children (yet), I certainly wonder about what I will feed them and what the best way is to feed them. Making your own baby food seems like a great place to start and seems so easy and wholesome. I really liked your ice cube trick. It just makes such great sense! Thank you. I totally agree with you about the "that's too spicy" thing! I still remember going to a friend's house for dinner when our babies were about seven months old. She made chilli and when she was pureeing leftovers for her son for the next day she offered me some to take home for my son. I hesitated saying I thought it would be-you guessed it- too spicy. But I accepted her offer nonetheless, and next day, after my baby had turned down my homemade offering of macaroni and cheese-gave it to him. He loved it! I really learned my lesson! Excellent tutorial by the way - homemade is definitely the way to go with baby food.